Booth's Innovation and Design Club (IDC) hosted its inaugural trek in New York City from February 28th to March 1st. 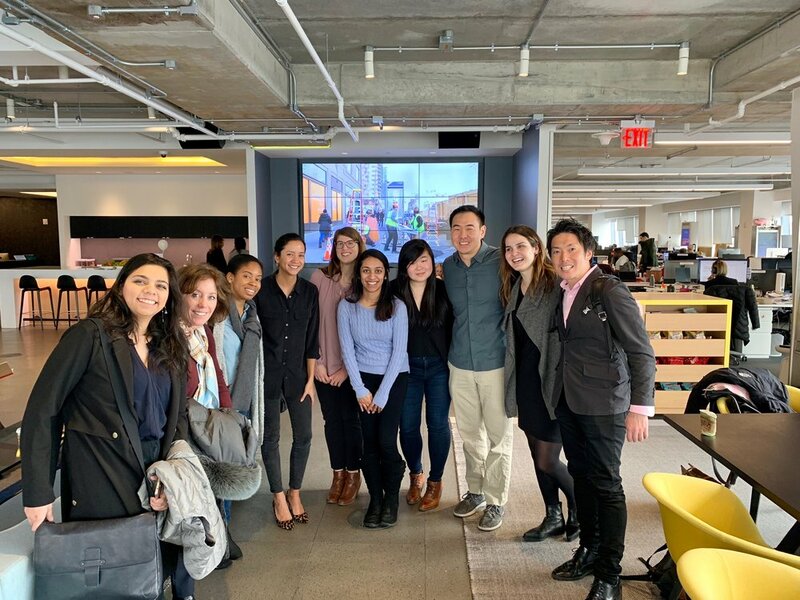 Led by co-chairs Gregory Kim and Shining Li, the purpose of the trek was twofold: to offer students a glimpse into the day-to-day of careers that encompass both business and design; and to enable MBA students to build rapport and connections for future opportunities. ideas42 @9am - Chief Innovation Officer, Piyush, explained what it's like to design and implement non-profit solutions. ideas42 combats social challenges including poverty and education inequity. What I found very intriguing is ideas42 embedding experts into agencies themselves. For example, their behavioral and design teams operate as public servants at all levels of organizations to quickly identify and address barriers in highly-regulated industries. method @10:30am - Method is a digital product firm that focuses on ethnographic research to design holistic experiences. Together with its parent company, GlobalLogic, the team of twenty balances both qualitative and quantitative data to redefine the customer journey. Since Method is a boutique firm, everyone wears different hats similar to a startup environment. Designers also push for all products to be sustainable upon launching, so that clients are left in good hands and post-mortems are minimized. Smart Design @2pm - If you are a fan of product design, Smart Design's culture of prototyping and scrum development is worth exploring. Smart Design caters to designers who love ideating with their hands to push ideas forward. Marketing director Shayla Persaud and her team walked us through their latest innovations, such as Gatorade's customizable hydration system and Ford's package delivery service. During the office tour, it was amazing to see so many sketches and cardboard prototypes on display. ZX Ventures @3:30pm - ZX Ventures is the global incubator of Anheuser-Busch InBev. We toured its massive NYC office, with floating whiteboards, self-serve taps, and floors named after your favorite brands. We heard from a panel of three former MBA students to better understand how creativity can bloom within a large organization. For instance, employees are encouraged to pitch ideas multiple times a year, in hopes of gaining entry into ZX Ventures’ start-up accelerator to brew the future. Ramen @ Tabe Tomo - We closed off our day at the newly opened Ramen shop from second-year Brian Kim. It was my first time having Tsukemen, a Japanese dipping Ramen, served with broth brewed for over three days. I will definitely be back for additional servings. I encourage you to visit, as well. Intersection @10am - A crowd favorite, Intersection is a smart city design agency that seeks to transform urban spaces. We learned that Intersection is the firm behind many interactive kiosks in cities, airports, and transit systems. Intersection recently took on the challenge of reinventing NYC's payphones, leading to LinkNYC - a WiFi-powered kiosk that serves as a charging station, GPS system and community directory. While Intersection has the ability to earn revenue beyond advertisements, the company’s data-privacy friendly culture and commitment to underserved populations speaks volumes on ‘service’ design. Edelman Digital @12:30pm - This interactive production agency revamps public relations in a way I’ve never seen before. For example, Edelman conceptualized KFC's yule log (which smells like fried chicken), and piloted a video game for razor blades at GameCon. The agency has made forming human connections central to the brands it serves, and reinforced the notion of human-centered design. Fjord @2pm - Fjord is the design and innovation arm of Accenture. Eudi Paz, its business design lead, shared a presentation on mapping out the customer journey. With Accenture, Fjord is equipped to implement change on a massive scale. What I enjoyed most about Fjord is that they took the time to answer our most pressing questions. For me, learning exactly what steps I should take to become a business designer from an industry expert left me with actionable steps to press forward. Overall, the Innovation and Design Trek was an enriching experience and apropos to design’s changing landscape within business. According to McKinsey, traditional companies that incorporate design increase their profitability at nearly twice the rate as their industry competitors. Nevertheless, the journey for MBA graduates entering more creative roles is convoluted. As expected, there is no one-size-fits-all approach. I realize that my success in landing an innovation role boils down to execution and preparation. For me, participating in the trek was just the beginning. From every company we interacted with, we were encouraged to start innovating now. Tackle challenges in our everyday environment (Harper Center, I’m looking at you), propose solutions, and build out portfolios. As more traditional firms acquire design agencies, or build out innovation centers from within, opportunities for MBAs will only increase. We just have to be prepared to jump in. And design, of course.